Exciting music for septet that explores seismic activity along the Ring of Fire through composition - drawing on cultures living on the ring and experimenting with the friction of geographic shifts to create a new harmonic topography. Boshnack’s inquiries led her to an exhaustive study of the Ring of Fire, the horseshoe-shaped region surrounding the Pacific that contains the majority of the world’s volcanos and experiences about 90 percent of its earthquakes. 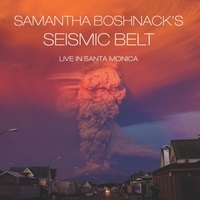 Her answers, from the purely emotional to the surprisingly scientific, can be found on Live in Santa Monica, the new Orenda Records release by Samantha Boshnack’s Seismic Belt. With Boshnack on trumpet and flugelhorn, Ryan Parrish on tenor and baritone saxophones, Paul Cornish on piano, Nashir Janmohamed on double bass and Dan Schnelle on drums, Seismic Belt is given added dimension through string players Lauren Elizabeth Baba, who solos on viola on track one and violin on tracks two and five, and violinist Paris Hurley, who solos on tracks four, six and seven. It’s the ideal ensemble to tackle these vital, sometimes volatile compositions, and it allows Boshnack to explore the median between the charms of her two primary vehicles as a bandleader up to this point—the 14-piece B’shnorkestra, with its touches of symphonic grandeur, and the small-group avant-jazz dynamism of the Sam Boshnack Quintet.